A series of cold fronts tracked across southern Australia, producing moderate falls in southwest and southeastern Australia. Heavy falls were recorded across western Tasmania, due to vigorous cold fronts and associated low pressure systems. Past seven days: At the start of the week, a weak cold front brushed the southern coast of Western Australia, with light rainfall recorded along the west coast and adjacent inland districts of Western Australia. As this system and associated cloudband moved across southeastern Australia, moderate falls were recorded over western Tasmania and in parts of the Victorian Alps. The cloudband stretched across southern parts of South Australia and produced light rainfall across the Eyre and Yorke Peninsulas and southeast regions. Moist onshore winds produced light falls along the north tropical Queensland coast and about the northeast Top End. In the middle of the week, moderate rainfall was experienced in southeastern South Australia, southern Victoria, and northeastern parts of the Victorian Alps extending to the Snowy Mountains in New South Wales as the next cold front and associated cloudband passed over southeastern Australia, while a strong low pressure system moved slowly through the south of Tasmania to the Tasman Sea. Snow was reported in elevated areas in Victoria and Tasmania. At the end of the week, a weakening low pressure system moved along the south coast and an associated cold front tracked through southwest Western Australia as wet conditions and rainfall returned. In the southeast, another cold front tracked over Tasmania, Victoria and southeastern New South Wales, while an associated low pressure system moved over the south of Tasmania. This system produced light to moderate showers about much of Tasmania, Victoria and areas of the Southern Tablelands of New South Wales. Rainfall totals in excess of 100 mm were recorded in parts of western Tasmania. The highest weekly total was 142 mm at Lake Margaret Power Station in western Tasmania. Rainfall totals between 50 mm and 100 mm were recorded in elevated areas in the Victorian Alps and the Snowy Mountains in New South Wales; and in western Tasmania. 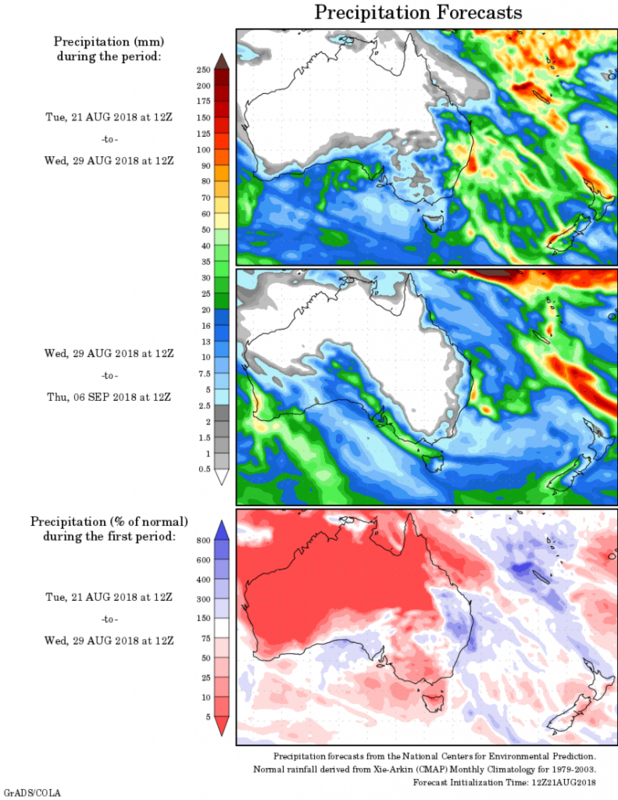 Rainfall totals between 10 mm and 50 mm were recorded along the southwest and southern coasts of Western Australia; the Eyre and Yorke Peninsulas and Murraylands district of South Australia; much of Victoria except the northwest; northeastern Tasmania, and elevated areas of the Snowy Mountains in New South Wales. Little or no rainfall was recorded in the remaining parts of Western Australia, the Northern Territory, Queensland, South Australia away from the southeast, and most of New South Wales apart from the southern inland region.